Despite the recent cold snap, many autumn-flowering salvias are still at the height of their beauty, providing form and flower colour when many plants in the garden are becoming dormant for winter. OGV contributing photographer and salvia enthusiast, Brett Horan, shares some of his autumn salvia favourites with cultivation tips and some beautiful photographs from his Dandenong Ranges garden. Salvia 'Anthony Parker' is a great autumn performer. I love photographing salvias – with their flowers held high above the foliage they have a wonderful way of capturing the softer sunlight of autumn. They are also magnets for nectar-feeding bees, butterflies and birds such as the native Eastern Spinebill. Here are a few garden-worthy varieties, many of which will flower right into winter. Most people would have seen Salvia leucantha or 'Mexican Sage' before and its popularity is well deserved. This is a tough shrub growing to around 1.2 metres and is covered in velvety purple flowers from late summer into winter. The flowers feel beautiful to the touch, so it’s a lovely sensory plant for children (and adults!). Like most salvias, it is low maintenance and only needs to be cut to the ground around August when new growth is visible at the base. The irresistible velvety flowers of Salvia leucantha. Salvia elegans or ‘Pineapple Sage’ is another great plant for kids, with fiery red flowers that glow at this time of year and leaves that smell like pineapple when rubbed or crushed. It’s a tall shrub, up to 1.5 metres and can be a lovely addition in a kitchen garden as the leaves can be used in salads and cool drinks. One variety, which I don't believe any autumn garden can be without is Salvia 'Anthony Parker' – a hybrid between S. leucantha and S. elegans. While it has a shorter flowering period compared with most other salvias (from late April into winter), its deep purple/blue flowers held over slate green leaves provide wonderful contrast in the garden, especially if paired with the golden tones of ornamental grasses. For something a little more unusual, Salvia confertiflora is worth growing for its velvet like orange/red flowers and stems. Originating from Brazil, I have it growing near the back of a bed where it enjoys protection from the hot afternoon sun and strong winds. 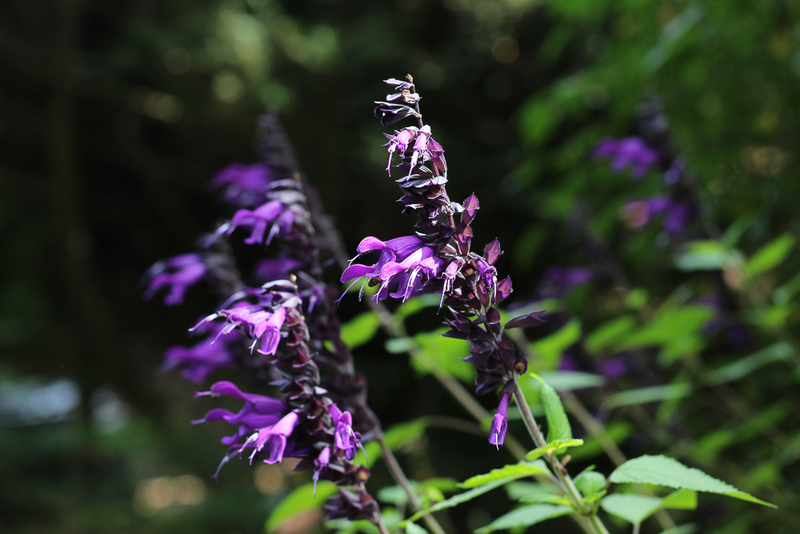 Many of the salvias from Brazil occur in elevated mountain regions with higher rainfall, so giving them a little protection and a few drinks during summer will ensure you get a wonderful display of its unique flowers in autumn. Another standout from this region of the world is Salvia ‘Costa Rica Blue’. Large, rich blue flowers with dark calyces are held over lime green foliage during spring, and again in autumn. As an individual specimen it doesn't have much shape, so I have it growing close to the endlessly flowering Salvia ‘Mystique’. The bushy growth and deep pink flowers of S. ‘Mystique’ team well with the flamboyant ‘Costa Rica Blue’. Salvia 'Costa Rica Blue' growing with Salvia 'Mystique' in Brett Horan's Dandenong Ranges Garden. If you like large deep purple flowers, then Salvia ‘Amistad’ is a must-have. Flowering from late spring and right through until late autumn, this salvia teams well with almost any plant. Just like S. leucantha, Salvia ‘Amistad’ has a gradual suckering habit and should be cut to the ground when new growth begins to emerge in late winter. A tough and long flowering variety is Salvia ‘Phyllis Fancy’. It has long arching sprays of violet and white flowers from mid-summer until winter and is best grown towards the back of a bed as it reaches around 1.5m tall and at least as wide. If you like this one, other varieties worth trying with the same style of flower include S. ‘Meigan’s Magic’ and the incredibly tough S. ‘Waverly’. Salvia ‘Phyllis Fancy’ is tough, long flowering and adored by nectar-feeding birds.